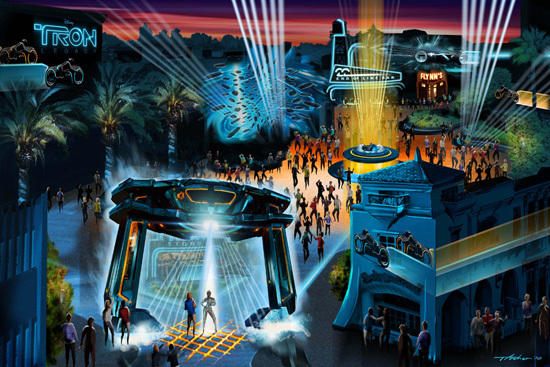 To promote the new movie Tron: Legacy, Disney is putting up a real-life “Flynn’s Arcade” from the original Tron movie. If you were lucky enough to go to Comic-Con you may have seen the one they had there, which I hear was basically an exact replica. I can only assume this uses the same setup. Note: They keep taking it down from youtube. If the embed doesn’t work click here. The new Tron Legacy trailer was released today by Disney at Comic-Con! I wish I could say this trailer made me more excited to see this movie, but frankly that’s not possible. The last time I had this much nerdy anticipation for a sequel was when Matrix: Reloaded was coming out. Needless to say that didn’t turn out so well. The original Tron was groundbreaking to say the least, but honestly hasn’t held up well over time. I’m still able to look past how dated it has become, but I doubt most can. In fact, I bet most either haven’t seen the original or can’t remember it. Who cares if you get what’s going on in the new one right? It has awesome special effects, a ridiculously hott chick, and a nerdy sci-fi story. Did I mention it has awesome special effects? I mean that dude’s shirt has more lights than a football stadium. Why does everything have lights on it? I mean I know it’s a video game, but seriously. Is there a rave afterwards? What’s the deal?